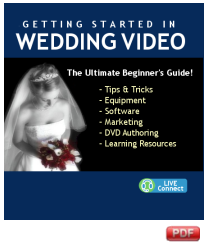 Getting Started in Wedding Video: The Basics is filled with practical advice to get you started in the world of wedding videography. Topics include the business and production ends, marketing, selecting the proper editing equipment, choosing the right camcorder, plus tips and tricks on shooting the best video and how to shoot better in low light. This small, 22 page e-book includes handy primers on marketing and advertising, pre-production preparations, what to shoot on the wedding day, editing and packaging the DVD or video, and generating referrals. The most unique feature of this interactive e-book is the interactive part: live links to additional information and best of all our “live connect” button that will enable you to instantly chat with a real person over the internet for immediate answers to pressing questions related to any topic in the e-book. * PLEASE NOTE: E-BOOK PURCHASES ARE NON-REFUNDABLE. Immediate download after purchase. Premium Subscribers can click here to download this book right now. Not a Premium Subscriber yet? Here are the details.